A long established method of protection concept for keeping flammable material outside of enclosures is the Ex p or purge and pressurisation method. Often used as gas sample analysers or for more elaborate control panels with possibly uncertified equipment, an instrument grade inert or clean gas such as nitrogen is pumped through a secure inlet valve to an external control unit fixed to the apparatus. The gas is then fed into the enclosure from the non-hazardous area. Prior to initial energising of the Ex p apparatus the control unit will flush out any hazardous material or “purge” the internal volume of the enclosure the with compressed air/gas. The clean gas will circulate inside the enclosure at a predetermined rate which is dependant on the gas or dust present outside, the internal volume of the enclosure and the appropriate national or international standard required. This purged gas/air will then be exhausted through an outlet valve to a non-hazardous location where it is ether disposed of or scrubbed and recycled. The gas can be from bottles or a clean/scrubbed air source from compressors and for that reason it can prove very expensive. However it is ideal for large areas such as container skids in a zone 1 or 2 hazardous location (see table 1.0) and where several different types of EX protection may be required, the Ex p solution will negate the need for other Ex requirements as the internal equipment does not need additional apparatus approvals or accreditation. There are three main Types of pressurisation for gas and one for dust. Depending on which, there are additional protection safe guards required such as leakage compensation, timers, alarms, shut down protection, pressure regulation, flow switches and over pressure protection. There is also a continuous flow system which is perfect for gas analysing as it is continually purging and in essence sets up a “containment system” whereby an internal flammable presence exists deliberately. See table 1.1. At indEx we are working closely with one of the world’s leading exponents of Ex p design and manufacture, whose systems are generally regarded as some of the most innovative and cost effective in the industry by only using the latest cutting edge technology. 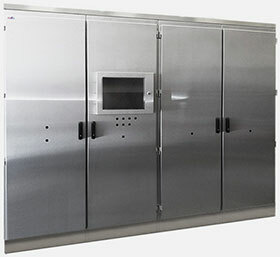 So it’s a perfect fit for indEx – we can supply enclosures that meet the most stringent standards for Ex p integration, we will do the test and certification and we are on hand to discuss your immediate requirements now and we can provide the exact solution to your Ex p requirement. 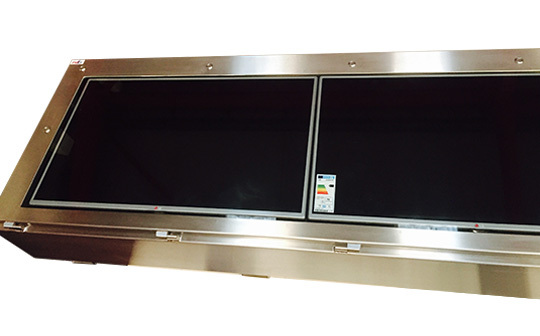 TV monitor enclosures with Ex p system fitted for world's leading bottled gas supplier. 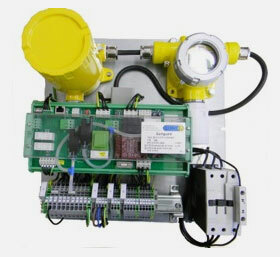 Monitor software allows operative to oversee each bottle filling station from remote area of plant. See case study for more details. 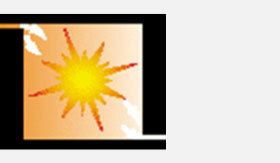 Ex p - pressure and purge Ex protection is one of the oldest forms of hazardous area protection concepts. It relies on a clean air or instrument supply to first purge and flush the containment system and then to keep a positive pressure internally, usually with leakage compensation and other methods of protection built in. At indEx we work closely with our partners to use a new certified method of Ex p called overpressure. 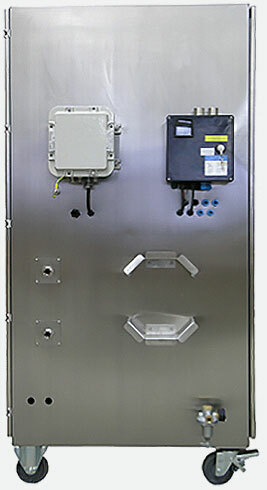 This still relies on the same principles as the purge and pressure method to keep out hazardous materials but all the electrical and contactor gear is inside the cabinet meaning we can make the enclosures from SS 316L smaller, lighter and far more cost effectively than current suppliers. The photographs shown are of the enclosures being readied for packaging and transport to our customer in the UK. Photo 1 shows the panel front complete with additional protection leakage compensation modules and other contact gear. Photo 2 is the rear of the enclosure showing easy to fit mounting. Photo 3 shows the Quingurad overpressure system - this is fully certified for zone 1 and 2 and only requires millibar pressure as opposed to usually 5-7 bar for purge and pressure systems. Photo 4 shows the internal test and intake pipe. As we make and commission our own systems we can either build you system complete or ship you the optimised size enclosure complete with the Quinguard system for you to fit out. For zone 2 we may just require photographic evidence of the internals and for zone 1 we would commission the full set up then certify. Then please send all details to sales@indexenclsoures.com for a quotation.